Can you deadlift 225lbs? This 78-year-old gran can. Shirley Webb can deadlift 225lbs without a sweat, and the video of it has left people with open mouths after it was shared on Instagram by her trainer yesterday. Two years ago, Shirley’s only form of exercise was mowing the lawn. She couldn’t get up off the floor without help, and had to hold onto the railing for support to climb the stairs, ESPN reports. But then she joined Club Fitness with her granddaughter in Wood River, Illinois, and got herself a trainer. She now goes to the gym twice a week and regularly deadlifts over 200 pounds. That’s nearly the same weight as Arnold Schwarzenegger. Or the average giant panda. 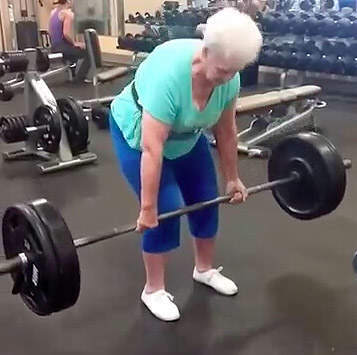 Last November, Shirley set the Illinois record for deadlifting at 237 pounds in her age and weight group. Hats off to you, Shirley. Amazing.